A CITY BY THE SEA. UNCOVER THE SECRETS OF A DROWNED WORLD. The gamer will need to adventure through a sinking world and traverse through the final resting places of man's greatest achievements... catacombs of technology... in search of an answer to creating a synthetic soul for Orchid. Use all of the advantages this lost civilization left behind to your advantage. And when those fail... use yourself: crawl over the giants and find their weaknesses close-up. WE BEGAN WITH THE LITTLE MERMAID. WE WENT FURTHER. Inspired by Hans Christian Anderson's original bitter-sweet story "The Little Mermaid," we have re imagined the tale as something quite unique. The original tale centered around a creature looking for a soul. The concept of death with no continuation of consciousness terrified the character... and so she became obsessed with the idea of gaining an immortal soul. That's where The Lost Pisces begins. It's a re-imagining of a timeless, curious story. In our story, you're welcomed to explore a collapsed world set sometime after humanity's technological peak... when the seas have begun to reclaim land mankind once called home. Instead of a mythical mermaid, we've created Orchid, a synthetic creature just as curious about the world above the waves, and who seeks the same thing as the mermaid... a soul. The Deluge: a collapsing, flooded world at the water's edge... the tip of an ice burg which now largely lays resting at the bottom of the sea. The massive mechanical denizens that rule the remaining land are rumored to have spawned from those icy depths, and they know no bounds when it comes to hunting their prey. The world beneath the surface becomes especially treacherous the more Pisces becomes human... it's hard to survive under water when you need air to breath. The Lost Pisces showcases a diverse set of landscapes. It's a living, breathing world filled with mysteries and hidden pieces of technology. Beneath the collapsed skeletons of a once-great civilization, The Deluge, amazing things rest in silence for you to discover... some things magnificent, and some unimaginably dangerous. Lost pieces of weaponry, mechanized barricades, and vehicles wait for the brave to claim them. And so do the mechanized gods which brought destruction to this world. Tread lightly... adventure lies in the crooked shadows of The Deluge. THIS WORLD IS A SANDBOX. DO WHAT YOU WANT WITH IT. There's more than one way to peel a potato. We didn't want the gamer to be restricted in how they destroy the 11 terrifying god-machines... we want you to be creative with your destruction. Move massive blockades with a hovercraft to set traps. Scale tall buildings quickly with your grappling hook to get higher vantage points within the shattered city scapes. Use a submarine to lure a land-based god into its watery doom. Or go completely crazy, and try to take one over from inside, and use one god to fight another. There's a lot to play with here. We've spent time building-in options in how you play through the world. We want you to play through more than once... to be inquisitive and to try new ways to solve the puzzles. We want you to feel as though there's always a few more secrets that the world holds, and they're worth searching for. 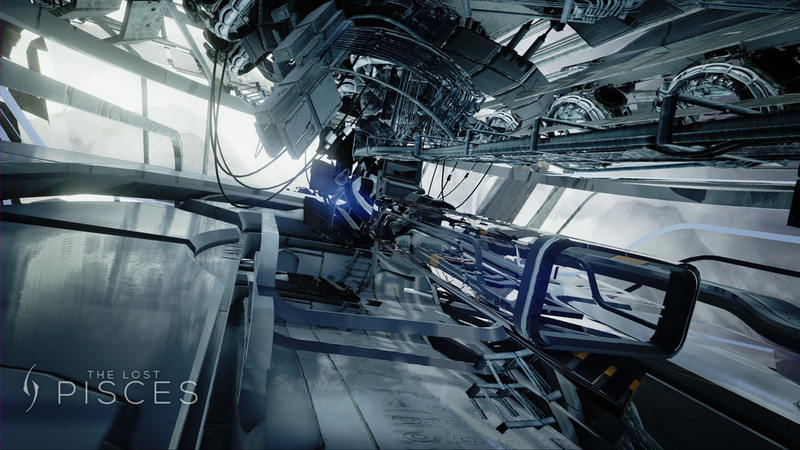 To find the lost god, Pisces, you'll need to work with Orchid... an AI built for discovery. A "siren-class" machine, she's searching for a soul, and the only way to attain one appears to be by eliminating the 11 massive god-machines stalking the world once ruled by mankind. The more you interact with her throughout the game, the more she'll discover about you. And unlike you, she begins the story as nearly indestructible. Careful though: the more human she becomes in her quest to become one... the more fragile she becomes as well. The Lost Pisces is planned for PC and XBOX One; though stay tuned as more details emerge for possible additions to that short list. We're developing Pisces to be somewhat scalable, though as always, a more powerful machine provides a better graphical experience. Unreal Engine 4 is our weapon-of choice, and can deliver extraordinary performance for many machine specs. Our suggestion, however, is to invest in an nVidia GTX 10-series graphics card, as it opens the doors to a more fluid and visually-overwhelming experience.